Strawberry cross stitch design.The pattern contains full stitches,back stitch and french knot. 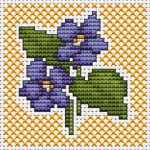 Small cross stitch pattern of violets on a yellow background. 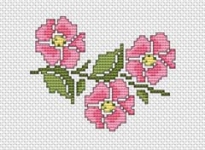 Small pattern of pink roses. Suitable for different craft projects. Blossoming yellow flower on a white background. The Queen of Flowers. 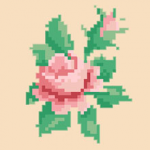 A beautiful single rose cross stitch pattern in pink colors. Cross stitch pattern of pink tulips. Especially well-suited for beginners. Small design of miniature roses suitable for making cards. Violet pansies on a light background. 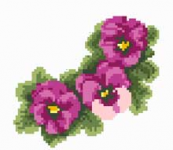 Pansies are regarded as a symbol of remembrance and "love in idleness". 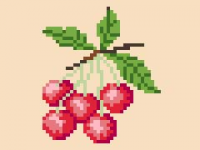 Small design of a bunch of cherries for your crafts projects.